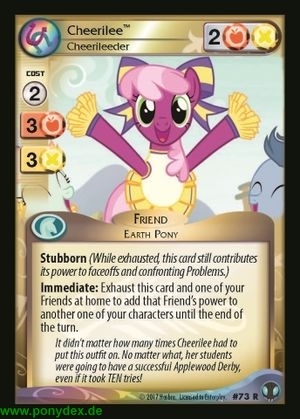 Immediate: Exhaust this card and one of your Friends at home to add that Friend's power to another one of your characters until the end of the turn. It didn't matter how many times Cheerilee had to put this outfit on. No matter what, her students were going to have a successful Applewood Derby even if it took TEN tries!